664 Woodville Hwy, Crawfordville, FL 32327 • 850-421-3248 between Tallahassee and St. Marks, FL. 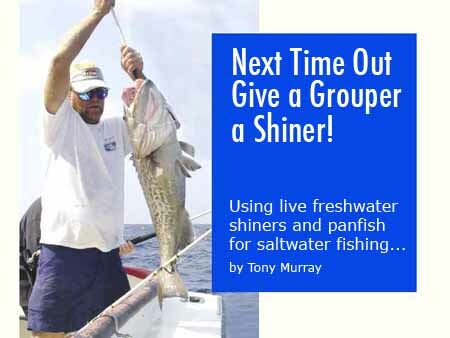 Using freshwater shiners for grouper fishing? Are you kidding -- why would you want to do that? And then the real question: Well... does it work? The idea of using live freshwater shiners for saltwater fishing first occurred to me when I had run out of pinfish over the top of an active grouper hole and nothing else would work to get the bite going again. In winter time, the pinfish disappear to who-knows-where and I was lucky to have any at all. 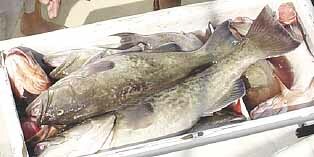 A live bait on an active grouper hole is a guaranteed catch. But, if you ain't got 'em, you ain't got 'em. Assess how much valuable fishing time you spent loading up on pinfish the morning of a big offshore trip and you'll quickly see why bringing live shiners with you is a real plus. 4) when freshwater fish are exposed to saltwater they act erratically which, in turn, increase the number of bites and fish caught. There are no state, federal of international rules or regulations that address using live freshwater bait fish in saltwater (or, for that matter, the use of saltwater fish for bait in freshwater... but we won't go there right now). dont set the rod down... this little shiner attracts grouper quickly. The only governing rules which do apply to this process are specific regulations pertaining to the manner of how these bait fish may be caught. Specifically, there are both net-size and net-mesh regulations for catching shiners. For catching panfish, which will be used for bait the panfish must be caught on hook and line. Shiners can be caught either by hook and line or by a cast net. To net shiners, I like to toss out a little bread, wait for the fish to start nibbling on it and then wrap them up with a good toss of my bait net. Note that according to the rules in Florida no panfish can be kept if caught via this method and must be returned immediately to the water. However, panfish may be used for bait if they are caught on hook and line. It is most important to carefully and gently handle the fish at all times. This is important to keep them in good shape for the upcoming trip. Remember, the less the fish are handled the better off they will be. Upon catching the shiners, place the fish in a well-aerated, large volume cooler. Don't toss them in the bucket. Gently place them in the bucket. A 30-gallon garbage pail works well with a bungee cord to hold the top on during this transport. Have a five-gallon bucket available to transfer water and fish as necessary. Forty-eight-quart coolers work as live wells. You can place about 25 six-inch shiners in a single cooler and close the lid and then gently add fresh water every 45 minutes until they are transported to your larger holding tank. The goal here: keep the fish in extremely good shape for the next leg of their journey to your house. I transfer the shiners into a large cattle trough of about 500-gallon capacity but, here again, a 30-gallon garbage pail works just fine. In the cattle trough tank I do not have any aeration or filtration because my surface-area-to-volume ration for oxygen exchange is fairly high and I have added native plants which clean the water and add oxygen. In a 30-gallon garbage pail, use a simple sponge filter with a small air pump and the fish will be fine. I keep these fish for a week or two prior to taking them out saltwater fishing. Having commercially raised, transported and shipped fish for years, I have learned many tricks of the trade to keep the fish in good shape while both awaiting the big fishing trip and while in transit to the fishing locations. In order to keep these bait fish in have a biologically active sponge filter in the tank which helps with keeping the water quality in good condition, make sure they have plenty of water (about 1/2 gallon per fish minimum) and if in doubt, add aeration with a sponge filter in the tank. Freshwater fish are much more hardy than saltwater fish. There is absolutely no way saltwater fish could be handled and transported like this, and then make it to the bottom with a hook through them still in good shape. As tempting as it may be, minimize the amount of food fed to these fish (stale bread) during their stay with you. This is extremely important approximately two days before the big fishing trip. The fish won't starve. Fish travel best with no food in their system, and this assures there is no waste put into the water which is what begins the cascading of problems like poor water quality, elevated nitrates, low oxygen and, thus the early death of your bait. There are several tricks to transporting these fish on the big fishing day. I typically put my transport cooler (a 60-quart cooler or larger) in my boat the morning of the fishing trip. The last thing I do before I pull out the driveway is transfer the bait into the boat. I net the shiners, put them in the bucket and transfer them five gallons at a time. It is important to keep the water chilled down by adding some ice because the saturation level of oxygen is increased. Also, keep the top of the cooler closed to keep the fish in the dark, which slows down their metabolism. I have drilled a small hole through the top of my cooler and run my air line to my small battery powered air pump into the tank. I have a biologically active sponge filter in the tank which helps with keeping the water quality in top shape. The real trick to successfully transporting fish is assuring that the water temperature does not get too hot for the fish in the summertime. Keep the oxygen level high and keep the water quality high. Directly before transporting the shiners, adding a few drops of Stresscoat (a commercially available medication for tropical fish) also helps. 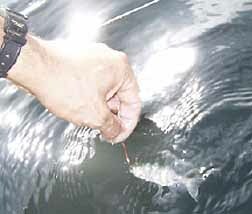 Stresscoat helps a fish replace its natural slime coating which it looses when netted, handled and transported. The product contains aloe which helps coat the fish and helps prevent the loss of electrolytes and also protects damaged tissue on fish. Four ounces is approximately $3.50 and can be found at tropical fish stores or on the internet. Just about half an ounce in 15 gallons of water makes a big difference. When you are ready to use the shiners, gently net the fish out of the tank quickly careful not to get too much saltwater in the tank. Success... one day's catch using nothing but freshwater shiners. When I first started experimenting with this trick, I took 20 live shiners out and brought 10 live shiners home to test how hardy they are on the water. Approximately 14 hours later they were doing fine. How long will a sixinch freshwater shiner with a #6 Circle hook through his dorsal flank live in saltwater? About 27 minutes (in my saltwater live well). How long will a freshwater shiner live in saltwater without a hook in it? About 27 minutes. So my question to you is: How long does a live bait need to stay on the bottom where you fish? One added benefit is that upon emptying the bait well of the shiners, you have some reasonably clean fresh water to splash over your deck, bait station and tackle area on your ride in. How well does this technique work? As you put that metallic glistening freshwater shiner over the side and you watch it glimmer and shimmer its way down to the depths of the bottom lets just say, "don't set that rod down!" Any photograph or other digital image provided to Jerry's Bait & Tackle may be used at the sole discretion of the owners of said establishment and may also be utilized and/or published in other media without prior consent or permission. Neither Jerry's Bait & Tackle nor the owners of said establishment may be subject to any claims for their use of the above-referenced photographs or digital images. Provision of these images is equivalent to consent consistent with the above language.